Posted on March 7, 2013 by elizagal •	This entry was posted in Motivation, Running, Self awareness, The Journey and tagged half marathon, Humor, inspiration, running, Sports, Tattoo. Bookmark the permalink. There are some pretty cute running related tattoos out there. Some day I may work up the courage to get my own :). Where did she get her tattoo? 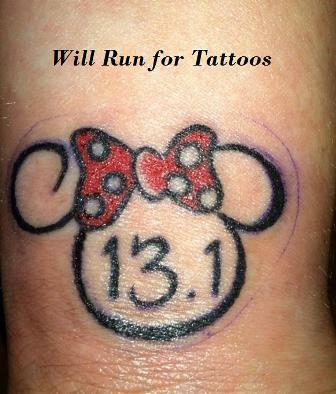 I want a race tattoo to commemorate my first (and only, so far) half marathon, but not sure where I want it. Small and similar to Minnie, but not Disney for me.